Dr. Luciana Lagana receives a CSUN Faculty Award for writing, hosting, directing and producing anti-bias documentaries. CSUN Psychology Professor and NIH-funded researcher Luciana Lagana has been writing, hosting, directing and producing numerous films and series, with the intent to help discriminated minorities. She is currently preparing several feature documentaries that she will use in her randomized controlled trials to test whether watching these films could decrease biases against a variety of minorities. She has incorporated her passion for filmmaking into her academic career through using her films in innovative experiments. Professor Nate Thomas is the Head of the Film Production Option in the CSUN Department of Cinema and Television Arts; he trained Dr. Luciana in film production and congratulated her on receiving the award by saying “You set an example for other artists. Creative work should inspire and make a difference!” Receiving this award confirms that Dr. Luciana’s creative efforts are unique and contributing to social change. (from the award’s description): One faculty member each year is awarded the Exceptional Creative Accomplishment(s) Award. The award honors exceptional creativity embodied in music, dance, film, a work of art, a theatrical production, or a written work. The award is generously supported by the University Foundation and carries a prize of $1,200. The criteria used in evaluating a nominated work will be: • originality of expression • innovative use of materials, concepts or technology • initiatory exploration in the fields of art, literature, music, theater, mass communication, radio, television, film and/or dance • critical recognition or acclaim given the work • professional evaluation of and support for the work. In addition to fulfilling her academic responsibilities in the Department of Psychology at CSUN, since 2006, Dr. Luciana has been pursuing her creative endeavors by studying acting, TV and radio hosting, screenwriting, directing, and producing in Los Angeles. She has over 50 IMDb credits for hosting and acting in many independent feature films, TV pilots, and web series, as well as several credits for her award-winning screenwriting, directing, and producing. She is the writer, lead actor, director and producer of the 2014 award-winning satirical web series INTIMATE TEMP AGENCY, focused on helping young people with special needs find employment. This series won Best Trailer at the 2015 Hollywood Reel Independent Film Festival, among other awards. Her 2014 DR. LUCIANA SHOW – AGING AND FALLING web series won numerous awards, including Best Educational Show at the 2015 WorldFest-Houston International Film Festival. 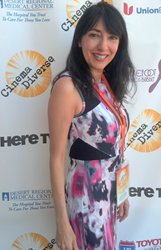 Her 2015 TV pilot DR. LUCIANA ON AGING AND FALLING also fared well on the film festival circuit. In addition, she wrote, hosted, directed, and produced three award-winning social impact feature documentaries, LGBT UNITED, UNDERSTANDING PAIN IN OLDER AGE, and AGING AND FALLING, which she has been using in her anti-bias experiments at CSUN. As previously reported, Dr. Luciana’s randomized controlled study on whether watching LGBT UNITED could reduce homophobia achieved successful preliminary results. Moreover, young adults who watched her film UNDERSTANDING PAIN IN OLDER AGE reported significantly higher levels of empathy towards older adults. With some of her research assistants, she presented the results of this pain-focused study at the 2017 Convention of the Society of Behavioral Medicine in San Diego, California. “It is an honor to receive the Exceptional Creative Accomplishments faculty award. I have admired past winners of this award for their documentary filmmaking and other creative activities. I hope to follow in their prestigious footsteps as an advocate for discriminated minorities using my films to decrease biases against them,” concluded Dr. Luciana. Luciana Lagana is a caring clinical and experimental psychologist, as well as a professor of psychology, gerontology, women’s health, and sexuality at CSUN, where she teaches classes and mentors many undergraduate and graduate students. Additionally, since 2002, she has been conducting government-funded research at CSUN on the physical, psychological, sexual, and social health of ethnically diverse, primarily low-income older women.